This is a case report of woman’s IUD that appeared to be “missing” from her uterus turned up in an unusual place her bladder. Chai, Wei et al.reported the case which was published in Journal-Medicine. In the present case a 26-year-old woman in Changchun, China, presented to the gynecology and obstetrics department of hospital and complained of urinary frequency and urgency, hematuria, and waist and abdomen pain lasting for 5 years. Notably, the patient had received symptomatic treatment for recurrent urinary symptoms without resolution. According to her medical records, an MCu IUD, a widely used IUD in China, had been inserted as a contraceptive method about 6 years ago. While still retaining the IUD, she became pregnant and underwent a cesarean section in February 2012. The doctors did not find any signs of IUD at that time, which suggested that the MCu IUD had displaced with both copper sides embedded in the muscular layer of the uterus. After recovering from the cesarean, another general IUD was inserted. In the hospital, physical examination findings and vital signs were within normal limits. Urinalysis revealed red blood cells, 324.43 mmol/L; white blood cells, 25 HP−1; bacterium, 18.16 μL−1. The pelvic ultrasonography (US) showed a strip of strong echo in the bladder and a strip of moderate echo in the uterus . The stripped materials were about 28 × 4 mm and 18 × 4 mm in size, respectively, which did not move with the body. US also revealed 2 spots with strong echo in the bladder in another section . Plain radiography confirmed 2 materials with strong echo, one of them was V-shaped, whereas the other was oval . Cystoscopy showed a complete MCu IUD with no damage to the bladder wall. The devices are generally very safe, and less than 1 percent of women who use the devices get pregnant each year, according to Planned Parenthood. But in rare cases, they can cause serious problems, including “perforation” of the uterus, meaning that the IUD pushes through the uterine wall. This happens in only about 1 in 1,000 women who get an IUD, the researchers said. 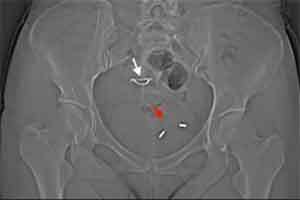 “Once an IUD perforates the uterus, it can move freely into many places,” including the abdominal cavity or the pelvic cavity (where the bladder is located), the researchers wrote in their report, which was published in the October issue of the journal Medicine.In the woman’s case, the IUD perforated the uterus, and once it was in the pelvic cavity, it perforated the bladder, the researchers said. The bladder perforation healed without treatment but caused chronic urinary symptoms, they said. The woman had a procedure to remove the IUD from her bladder and did not experience any further complications, the report said. Perforation of the uterus by an IUD usually happens when the IUD is inserted. In the Changchun woman’s case, the uterine contractions she experienced as a result of pregnancy could have helped the IUD perforate the uterus and migrate to another area, the researchers said.This case report demonstrates that “a missing IUD should be noticed and immediately removed to avoid further complications,” the researchers wrote.